Maddy has the fascinating tale of Bom Jesus, which left Portugal in 1533 with 18 tons of Fugger’s copper, 4 tons of tin, elephant tusks, gold and silver. The ship went missing and was discovered 475 years later. The Nau Bom Jesus was one among them and all of 400 or so tons in displacement. That the Portuguese knew how to build sturdy ships is clear, but you must also understand that the life of such a ship was not more than four or five years. Usage of nails, galagala caulking, lead in the seams, and a final black coat of pine tar from Germany gave these ships a sinister look. The heavy guns and cannons they carried for defense made them difficult to confront. The crew comprised a captain major, a deputy, a captain, a record keeping clerk (the royal agent – like our Barros or Carrera), a pilot and a deputy pilot. Then came the master, the boatswain, ships boys, pages and the sailors or seamen. We can also see chaplains, German bombardiers, stewards, specialist technicians like carpenters, caulkers and barber surgeons in this group. There was once some misunderstanding between the authorities of the two temples and Trikkanamathilakam temple authorities wanted to teach the smaller Guruvayur temple a lesson by not sending the elephants for the festival. 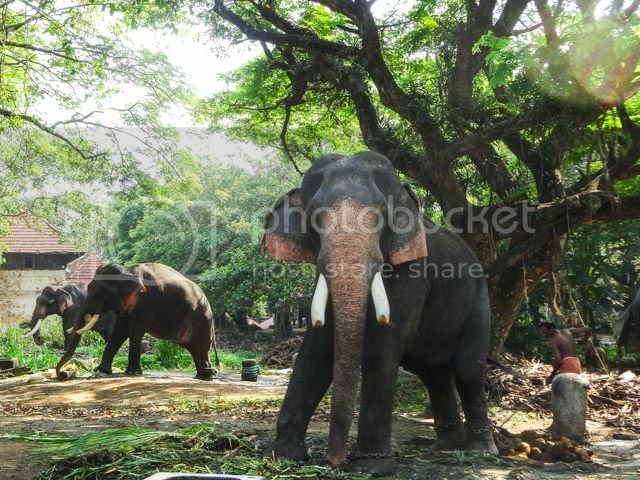 The elephants were tethered at the Trikkanamathilakam temple after the festival there. Apparently, the elephants managed to break the iron chains at night and ran all the way to Guruvayur temple, with their bells clanging and reached the temple well before the time for the ezhunnallathu (the ceremonial procession of the deity). Kurnool, some 120 miles south of Hyderabad, became in the 18th century semi-independent under its own Pathan Nawabs. It was captured by Haidar ‘Ali of Mysore, and in 1799 was given to the Nizam at the division of Tipu Sultan’s territory. It was ceded by him to the East India Company in 1800, although the Nawabs were left in charge in return for a tribute to Madras. The last of them was judged guilty of treasonable activity in 1838 and the territory was annexed, although left in the charge of a British Commissioner and Agent until 1858 rather than under the normal Collector and Magistrate of British India. The arts flourished under the Nawabs and an offshoot of the Hyderabad style of painting can be located there (Zebrowski 1983, pp. 272-3). In the 19th century Kurnool produced paintings on leather of both Hindu and decorative subjects, but this painting by Kurnool artist would seem to be a rare instance of a Deccani ‘Company’ painting. The artist has combined a delicate Deccani approach to landscape with the more naturalistic traditions associated with European portraiture. Koenraad Elst takes to task those who think that Vatican was originally a Shiva temple and has other miscellaneous crazy ideas. The 79th carnival will be up on Independence day. If you have any nominations, please leave a comment.